Set in the picturesque village of Grindleford, in the beautiful Dark Peak, our accommodation is a stylish and contemporary eleven bedroom barn conversion catering for up to 24 people and offering the very best in home from home luxury. With wonderful views of Froggatt Edge and the surrounding valley, Grindleford offers the perfect location for our group to practice yoga, hike and to explore all that the Peak District has to offer. There will be two yoga classes each day and in between a full day hike to explore this most beautiful area. The guided hiking, yoga classes, all accommodation, breakfast and lunch are included, plus dinner on Friday, Saturday and Sunday. The Cattle Shed is situated in the Hope Valley in the heart of The Peak District, close to the market town of Bakewell, the magnificent Chatsworth House and the beautiful medieval Haddon Hall. The location is a walker’s paradise; Padley Gorge and the National Trust Longshaw Estate are on the doorstep, whilst the famous climbing edges of Curbar, Froggatt and Stanage are just 5 minutes away. Guiding is by Kevin, who is a fully qualified International Mountain leader and the yoga classes will be run by Yen who is a fully qualified and experienced teacher. We have exclusive use of this brand new luxury accommodation for this Yoga Hikes August Bank Holiday weekend. We will be based in the heart of the Peak District, situated in a stunning location close to Chatsworth and Bakewell. The Cattle Shed, Grindleford is a brand new development completed in 2017. Converted from an old cattle shed and built to an exceptionally high standard, this rustic and contemporary luxury development provides a unique venue for our Yoga Hikes August Bank Holiday break to enjoy the beauty of the Peak District National Park. Set in the picturesque village of Grindleford, in the beautiful Dark Peak, The Cattle Shed is a stylish and contemporary eleven bedroom barn conversion catering for up to 24 people and offering the very best in home from home luxury. With wonderful views of Froggatt Edge and the surrounding valley, Grindleford offers the perfect venue for our yoga hikes August Bank Holiday break. We have our own dedicated yoga room on the upper floor looking out over the gardens. We offer a welcome yoga class on Friday evening to help you unwind from your journey and two yoga classes each day, stretching out our legs on a moderate hike in between. The yoga is varied and so will be suitable for beginners as well as for those who have practised before. Sessions will take place on the Friday evening, Saturday, Sunday and Monday, before breakfast and after we return from our walks on Saturday and Sunday. The general focus of the morning sessions will be to energise and warm up the body for our walk, and in the evening , will be to stretch out those tired muscles and relax the body. Yoga mats and props will be provided but you are most welcome to bring your own mat if you prefer. The location is a walker’s paradise; Padley Gorge and the National Trust Longshaw Estate are on the doorstep, whilst the famous climbing edges of Curbar, Froggatt and Stanage are just 5 minutes away. The fabulous Monsal cycle trail and the typical Peak District village of Hathersage are close by. All meals are included in the cost of the weekend. Friday light supper, Saturday, Sunday, Monday breakfast ; Saturday and Sunday dinner, plus packed lunches on Saturday, Sunday and Monday will be provided by us. 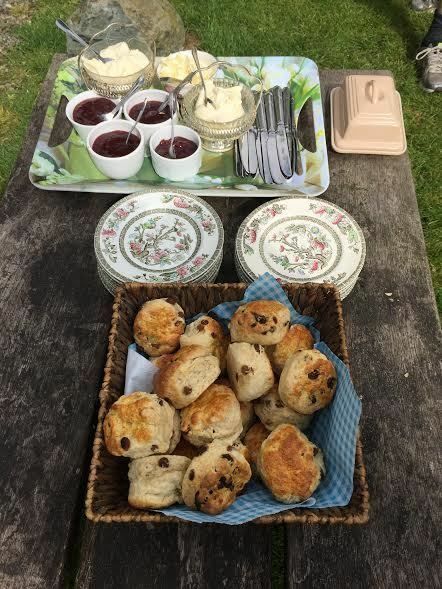 It has become a popular feature of our breaks to offer large quantities of tea and home-made cake at the end of each walk. Walks are graded moderate (by Peak district standards), with approx walking time 5-6 hrs and distance 8-10 miles for the Saturday and Sunday and shorter optional walk on Monday. We have our own dedicated yoga room on the top floor looking out over the gardens. We offer two yoga classes each day and we will stretch out our legs on a moderate hike in between. The yoga is varied and so will be suitable for beginners as well as for those who have practised before. Sessions will take place on the Saturday, Sunday and Monday ,before breakfast and after we return from our walks on Saturday and Sunday. The general focus of the morning sessions will be to energise and warm up the body for our walk, and in the evening , will be to stretch out those tired muscles and relax the body. Yoga mats and props will be provided but you are most welcome to bring your own mat if you prefer. Situated in a stunning location close to Chatsworth and Bakewell, The Cattle Shed, Grindleford is a brand new development completed in 2017. Converted from an old cattle shed and built to an exceptionally high standard, this rustic and contemporary luxury development provides a unique venue for our yoga and hiking group to enjoy the beauty of the Peak District National Park. The beautifully appointed ensuite rooms and open plan lounge dining room with spectacular views across the Hope Valley, make it the perfect space to relax, practice your yoga and enjoy some great hiking. Guests can relax in in the comfortable lounges and outdoor areas, dine alfresco on the large south facing terrace or take advantage of the great local pubs in the area. The large games room provides us an excellent space for yoga and there’s an additional terrace with barbecue and fire pit for those warm August Bank Holiday evenings. All rooms are on a twin share basis : all rooms have super king size zip and link beds (so these can be twin rooms or large double). 10:00 – Departures or take the opportunity to explore the local area with a shorter guided morning hike returning about 1230. The balance of £300 (or £310 if taking the transfer option) will be due within 8 weeks of the start date and you should arrange a bank transfer for this. Suggested trains are below from main Stations to Hathersage, the nearest train station which is 3 miles away. If you are travelling from elsewhere, please use trainline to plan your journey to coincide with the arrival of these trains if possible. We can drop you off for these trains after breakfast if you do not want to join the shorter walk on Monday. If you are joining the walk on Monday, there are various trains departing just before 1pm from Hathersage.